Batting: Macleod 140* off 94 balls, KJ Coetzer 58 off 49 balls, MH Cross 48 off 39 balls, Munsey 55 off 51 balls, Berrington 39 off 54 balls. Bowling: Plunkett 2/85 in 10 overs, Ali 0/66 in 10 overs, Adil Rashid 2/72 in 10 overs. 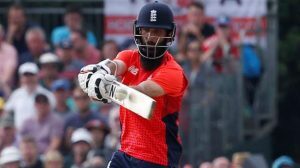 Batting: Johnny Bairstow 105 off 59 balls, Alex Hales 52 off 56 balls, Moeen Ali 46 off 33 balls, Liam Plunkett 47* off 45 balls. 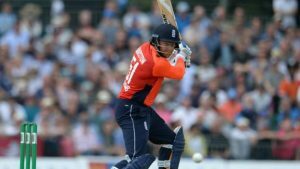 Eoin Morgan’s call to field first was excellent as the weather was cloudy and the English side’s history with chasing totals is exceptional. The pitch looked pristine and had a lot to offer to the batsmen; bowlers not so much. The match started as Scotland sent Cross and Coetzer to open the innings. Mark Wood was given the new ball as England expected quick wickets. But, the pitch was favouring batsmen and Cross and Coetzer made full use of it as the two put up a 100-run stand inside 14 overs. Coetzer reached his fifty and was eyeing a century. But, his hopes were shattered by Rashid who got his wicket in his 3rd over. And, one over later Cross also departed after Plunkett denied the opener his well-deserved fifty. Berrington joined Macleod. Berrington was dropped by Root and this catch proved to be costly. As, Macleod and Berrington shared a 94-run partnership to defy England a wicket. Macleod was the current concern for England, and his flawless fifty was a big proof of that. At this point Scotland were 200 up with 8 wickets in hand. England needed a wicket to halt Scotland’s progress. 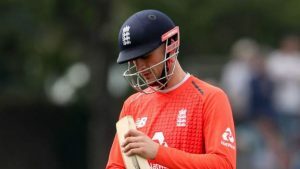 Right then, Morgan’s persistence with Liam Plunkett paid off as he took the wicket of Berrington to give England some hope. Munsey joined Macleod and together the two batsmen began to dominate the English bowlers by scoring runs all over the ground. The small ground and the pitch were playing their role as frustration began to take over the English bowlers. Scotland passed the 300-mark inside the 43rd over. And in the next over, both batsmen brought up their hundred run stand. Munsey got to his fifty but lost his wicket to Rashid. 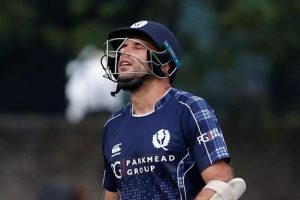 However, Scotland had nothing to worry about as Macleod brought up his 7th ODI hundred in the same over; A sensational knock. Macleod was joined by Budge and yet another 50-run stand was shared between the two as Scotland passed 350 runs. Budge fell in the 49th over to Mark Wood as Scotland finished 371 runs in 50 overs; their highest ODI total ever. Macleod walked off the ground as the crowd applauded him for his unbeaten 140* runs off 94 balls. England needed 372 to win this mach inside 50 overs. Johnny Bairstow and Jason Roy opened the English innings. 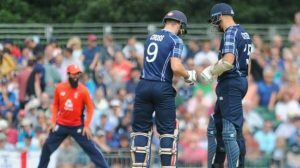 Both batsmen attacked Scotland’s bowlers from the very start as Bairstow reached his fifty inside 27-balls. England were scoring at a run-rate of 10 per over and this helped them to bring their hundred inside 10 overs. Scotland’s bowlers were looking cluless and were being scored off by these batsmen all over the ground. At this point, the Scottish captain made a change in bowling and brought Watt back into the attack. This move paid off as Watt caught & bowled Roy to get the first breakthrough of the innings. 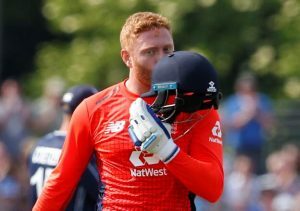 But, this wicket did not slow down Bairstow as the English opener made history by scoring a century off 54 balls and becoming the first English player to scored 3 centuries in a row. 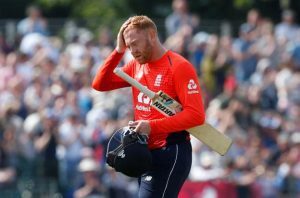 But, Bairstow’s happiness only lasted 1 over as Berrington claimed his wicket in the 18th over and England were now 2 wickets down for 165 runs. At this point, England Vs Scotland match was still pretty much a one-sided affair with England still favorites to win this match. 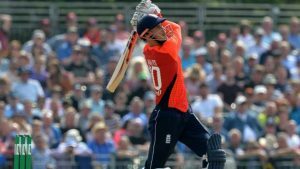 Hales and Root were present on the crease and another 55-run stand was shared between the two as Scotland searched for a wicket. At this point, Root was playing quite exceptionally but he got run-out by a yard due to poor running and Scotland got their 3rd wicket. 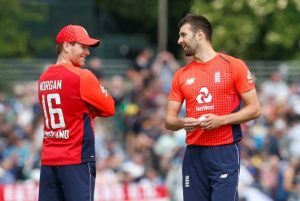 The English captain, Morgan joined Hales. Both batsmen shared a 25-run partnership and Hales reached his well-deserved fifty. However, Alex’s joy was short-lived as he and Morgan departed in two balls and suddenly Scotland took the commanding position in this match. With 127 runs required from 19 overs, England sent Moeen Ali and Sam Billings to finish the job for them. But, Scotland were not surrendering control any time soon as Sam Billings departed after only scoring 12 runs; courtesy of Watt’s superb line and length. England had hopes from David Willey but he got out as Evans got his 2nd wicket of the match. 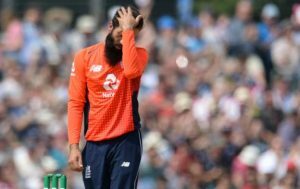 England Vs Scotland match had turned on its head and all the responsibility had now come on Moeen Ali’s shoulders. Ali along with Plunkett shared a 71-run partnership to take England near victory. However, a late strike from Watt removed Ali, and complicated things from England. 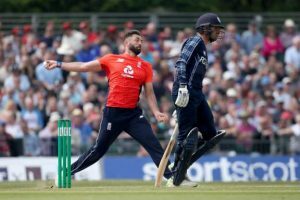 Plunkett was England’s last hope as they needed 16 runs to win this match from 18 balls. Pressure was mounting on England as they looked desperate for some runs. More pressure was added when Adil Rashid got run out in an attempt for a second run. Scotland needed 1 wicket and England needed 10 runs to win this match. Sharif was given the 48th over and he delivered as promised. The bowler took two wickets to hand Scotland a historic win over England. This is the end of England Vs Scotland Only ODI. Keep visiting Allsportspk for more cricketing updates.